يشكل Sea Star Apartments بموقعه الممتاز في المدينة نقطة انطلاق جيدة لاستكشاف أفضل ما فيها من معالم ومناطق نابضة بالحياة. يجذب هذا العقار ذو 4.5 نجوم، والذي يبعد 1 km فقط عن وسط المدينة و 40 km عن المطار، الكثير من الزوار سنوياً. يوجد العديد من المعالم السياحية الأكثر جذبًا للسياح في هذه المنطقة. إن الخدمات الممتازة وحسن الضيافة العالي في Sea Star Apartments تجعل إقامتك تجربة لا تنسى. هذه بعض الخدمات الموجودة في هذا الفندق: واي فاي مجاني في جميع الغرف, توصيل من البقالية, خدمة سيارات الأجرة, تخزين الأمتعة, واي فاي في المناطق العامة. ادخل إلى واحدة من الغرف 20 وتخلص من عناء نهار طويل بمساعدة مجموعة كبيرة من الخدمات كمثل تلفزيون بشاشة مسطحة, غرف لغير المدخنين, مكيف هواء, مكتب, شرفة/ تراس الموجودة في بعض الغرف. يقدم الفندق العديد من الفرص للاستجمام كمثل حمام سباحة خارجي, حديقة. إن Sea Star Apartments هو مكان مثالي للمسافرين الذين يتطلعون إلى الراحة والاستجمام في المدينة. We had a great stay at the Sea Star Apartment, that had an amazing view over the bay. Also the facilities were excellent. The couple who manages the apartment are very helpful and friendly and they made us feel very welcome.Also the swimming pool and bbq area is a plus. Apartments are pretty nice and big. Bath rooms could be more modern. Kitchen is filled with essentials. The owners are just great people! Super friendly and helpful. Thank you very much! Wonderful. Was here 13 years ago and it’s newly furnished. Still the best view point of Arlie Beach. The reception staff are nice and they have a huge schnauzer (every cute baby girl). The room is clean and big enough for just two of us. The balcony is dreamy with parrots flying just right before your face (you can even touch them). Trudy was very helpful and kind, the best hostess. We had nice view on the hill and clean room with mostly everything you need. I like their idea to keep some groceries that other customers can use them as well like baking paper, salt and pepper stuff. I’ll highly recommend people to come to this lovely apartment. 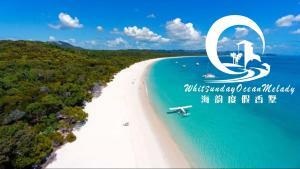 Thanks for giving us such a great time in Airlie Beach. Quiet location with stunning views of the waters, quiet steep up the hill but a short taxi ride will take you to town and port for trips. Hosts were very welcoming. The 1 Bedroom Apartment was the biggest we have stayed in and we have been in a lot of Apartments, King bed with pillowtop was very comfortable, even had a small flat screen TV on the dresser, walk in wardrobe huge, bathroom had twin hand basins, Kitchen had a dishwasher, laundry had washing machine and dryer, balcony wrapped around from lounge to bedroom, views were magnificent, 2 glass sliding doors to lounge area and 1 to bedroom area. Lounge had 2 very comfortable sofas and a large flat screen TV, separate dining area with seating for 6, this Apartment was the first one we have seen with it's own lockup garage. Only drawback was the steep climb uphill coming back from the town centre, for the elderly or unfit it can be quite a challenge and a vehicle would be recommended. View from the top of the hill was amazing! The best part of the hotel was the view from the top of the hill. We took some amazing pictures from the balcony. The worst thing is the walk up the hill, its grueling especially with an 8, 7 and 3yo in stroller. If you have a car then I'd recommend it. If not and you have kids then its probably not a good choice. Apartment was clean, in good condition. We didn't use the pool, its basic but nice. 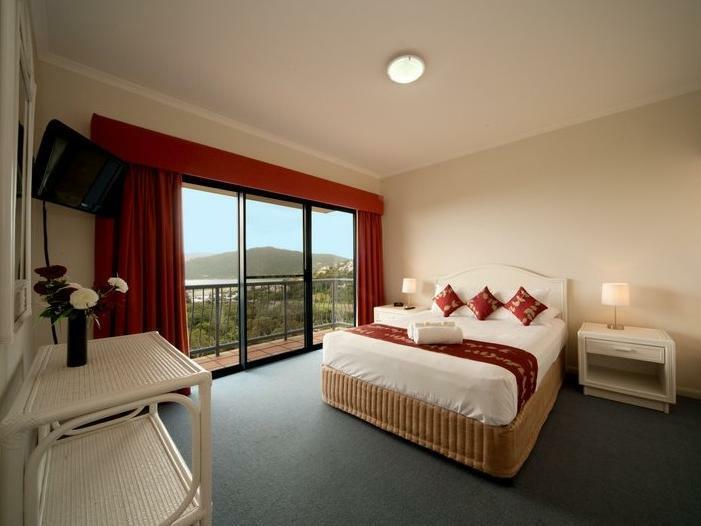 We travelled from Port Douglas to Brisbane over 2 weeks & stayed at 5 different apartments all similar prices & facilities - this was by far the best. Welcoming & helpful friendly staff. 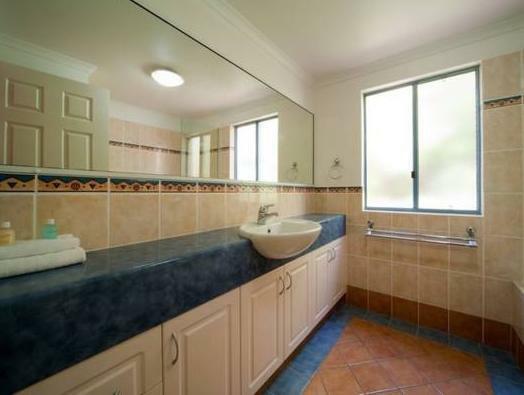 Good location with great views over Airlie ( we did have a car). Well equipped kitchen which encouraged us to stay in & cook because the apartment was such a nice place to be. Apartment lay-out ideal for us - one bedroom with en-suite & another to the rear up several steps with it's own bathroom. Would definitely return here & wouldn't hesitate to recommend it. Just as expected with the added bonus of great views. 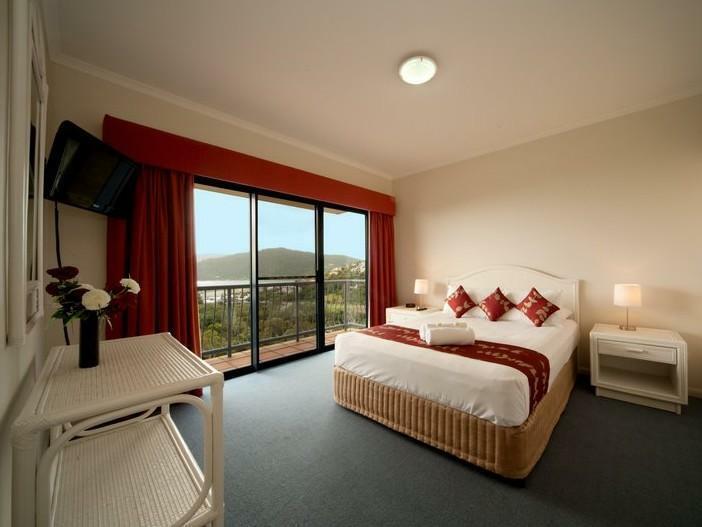 The Sea Star Apartments proved to be a highlight of our extended tour of Australia in October. Julie gave us a warm welcome to the apartments owned and managed by herself and husband Alan. 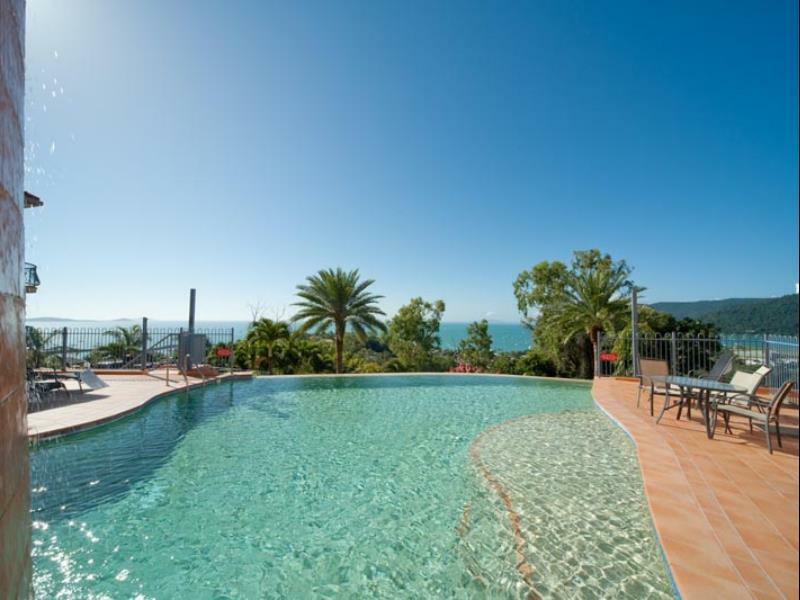 They can justifiably be proud of the quality and position of their property where every apartment has a great view of Airlie Beach bay. In our case we had a top floor apartment but as there are only two floors I doubt whether the view from there is any better than our downstairs' neighbours had. We appreciated the spaciousness of our rooms as well as the tasteful decor and immaculate furnishings. The two long curving balconies added to the feeling of space and provided us with a a great viewpoint on to the harbour below. Yes, there is a climb from the town up to the apartments but that is why the views are so stunning. Having a rental car was a bonus for us, especially as we are no longer young. We even had our own individual garage allocated on arrival. Thank you, Julie and Alan, for the privilege of staying at the beautiful Sea Star Apartments. What a great place to stay. Julie was spot on recommending tours. Apartment was clean and very well maintained. Will definitely tell friends. Located on a hill overlooking scenic Aurline Beach. Perfect view. Close to town but very hilly. Would stay there again, but not for older people given hilly location. Overa a nice spot. The view is amazing and the staff are friendly. Everything is clean and tidy which we are really impressed. If I travel to there again, I will stay in the same place even I need to walk to the top of the hill.